Verse: Psalm 106:1a - Give thanks to the Lord. 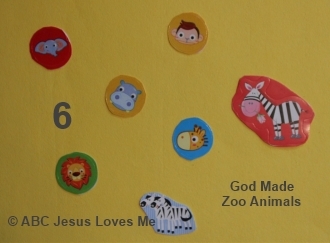 - With a piece of construction paper as the background, add stickers or pictures of zoo animals. May also glue on animal crackers. Add the number "6" to the page. - Baby Zoo Animals - Together play this computer game which names a zoo animal for each letter of the alphabet. Pressing any key continues this activity. - Color one of the ABCJLM Green Worksheets with a green jumbo crayon. - Do a Color Walk: Walk around the house or neighborhood looking for green. 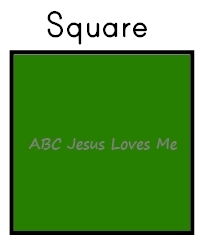 Color, paint, or draw on the Square worksheet with the color green. 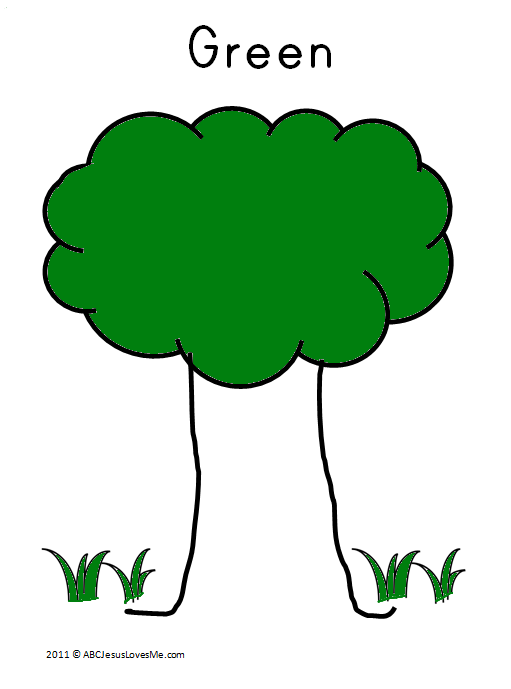 - Do a Shape Walk: Walk around the house or neighborhood looking for square. 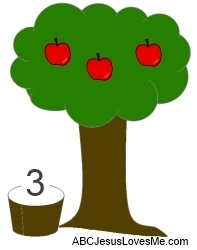 This week use markers to decorate the Apple Tree Number #3 worksheet. Add three apple stickers. Continue to count items throughout the day. Putting clothes in the laundry hamper or basket is an easy chore for 2-year-old children. Help the child make this part of his daily routine. - Eat animal crackers while reading the story. - Visit a zoo or local safari. - While reading the book, spend extra time looking at the illustrations. Go back later and name the animals. Ask several higher level questions: Why? What do you think? How? Play with play dough. Make "snakes" and balls. Add in safe kitchen utensils and cookie cutters. If possible, use green play dough. Instructions to make your own play dough. Tie a string to the end of a beach balloon and then to a higher place. Practice jumping up to hit the beach ball.